The Clapper Bridge near Killeen,Killadoon, Louisburgh, County Mayo. Welcome to the official website for the town of Louisburgh where to go. 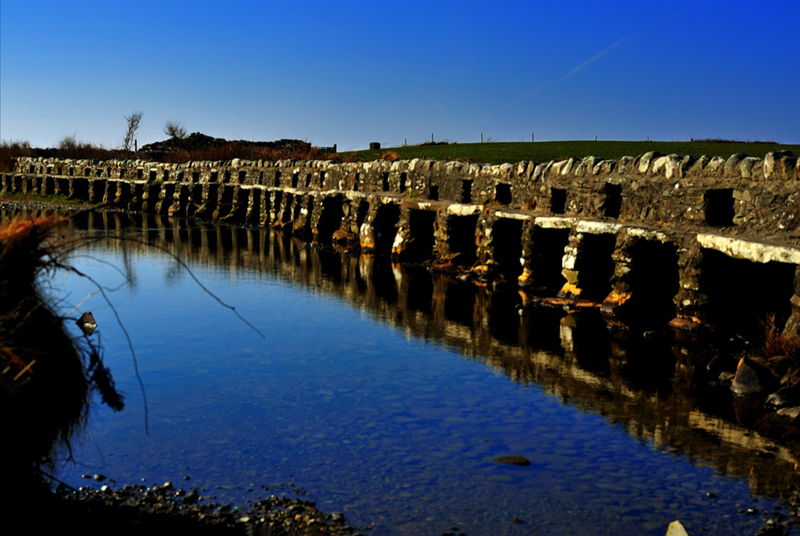 Some ten kilometres west of Louisburgh, near the villages of Killeen and Killadoon lies Bunlahinch Clapper Footbridge. It is a unique and interesting feature, with an interesting history. The bridge is a low, curving construction, 130ft long, formed of 38 boulders spanned by slabs of stone, and takes walkers across a wide but shallow ford. This picturesque and remarkable Clapper Bridge takes its name from the word Clapper which is the plural for the Anglo-Saxon word 'Clam' and signifies a construction which is Roman in origin and consists of a row of two uprights crossed by a topping slab. The area was formerly known locally as 'The Colony', but it's past is seldom talked about and few are willing to recall the memories of its brief and shameful existence. This is because it was really known as a "Colony of Jumpers", so called because the village came into being as a result of the practice known as souperism. In 1863 John Alexander, who built the 'Clapper Bridge' across the streams that separated the two rows of houses, replaced Hogan as Secretary of the Society. Much of this effort was in vain however as the local people (other than the converts) strongly objected to the presence of the society and did nothing to encourage their farming endeavours. After only twenty years the society disappeared from the district, although their teacher, a Miss Mc Greal, remained for some years in the living quarters of the school. Richard King purchased the land in 1878 from Lord Sligo for a figure of £650. Little remains today of the school and all that remains of the colony is the skeleton of 3 houses. The church was demolished in 1927 and all that is left are the entrance gates. The Clapper Bridge remains a unique and unusual monument, to a shameful period of Irish history. Mayo County Council maintains the bridge in unblemished condition.